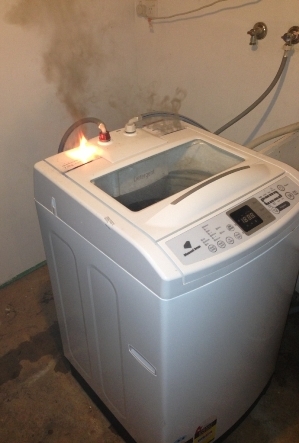 It has been more than two years since Samsung Australia recalled six models of top loading washing machines because they pose a fire risk but there are 70,000 machines across the country that haven’t yet been fixed – 8,500 are in WA. Consumers with a Samsung top loader need to urgently check the serial number on their washing machine. You need to make this a high priority to prevent a fire that could destroy your home and endanger lives. You can also visit www.samsung.com.au, call 1800 239 655 (8am – 8pm AEST every day) or email wm.samsung@samsung.com to find out if your machine is one of the recalled ones. If you have an affected appliance, telephone Samsung to arrange for a technician to come out and rectify the problem free-of-charge as soon as possible. In the meantime, it is recommended that you do not operate the machine when you are not in attendance and switch it off at the power point when not in use or if there are any signs of smoke. About 145,000 of these top loading washing machines were sold in Australia through various retailers between 2010 and 2013. 14,483 affected units were supplied to WA and of those, only 5,973 have been made safe. Samsung has been trying to locate the owners of the machines and there has been a fair amount of publicity in regard to this recall but there are still thousands of consumers who haven’t heard the message, or if they have, they haven’t reacted to it. We need owners of these appliances to act now! According to Samsung, fires occur when water condenses onto an internal connector (motor connection) causing tracking or arcing of the electrical current. The most recent reported fire was in Parmelia on the 12th of August 2015 when a top loader burst into flames and caused an estimated $5,000 worth of damage. Worryingly a machine that caught fire in a Shenton Park home in December 2014 led to damage costing about $10,000. Even if your machine has been repaired it is always wise to monitor any electrical appliance and if there are any signs of malfunction, turn off the power and contact the manufacturer immediately. Consumer Protection would be keen to hear from you if there are any repeat problems with your machine – call us on 1300 30 40 54. For further information about this and other product safety recalls in Australia check out: www.recalls.gov.au.